Affiliate links are used. If you purchase through these links, we get a small percentage of the sale, which helps pay for the upkeep of our blog. Here’s just a little nod to my career calling in these cuties that I created years ago! They first appeared HERE. While I’m all about helping kids and teens develop more mental muscle and social emotional skills, these little bits of cuteness are too adorable not to share here, too! They’re decorative and can do double-duty, so why not? If you have a little extra newspaper laying around, some thread, a needle and a Sharpie, you’ve got all the makings for these sweet little numbers that are as happy nesting in a bowl in the corner…as they are being strung across the mantle for a quick reminder of all the things that are important…whether it’s Valentine’s or not! Keep reading below, or check out the tutorial on the original post. 1. 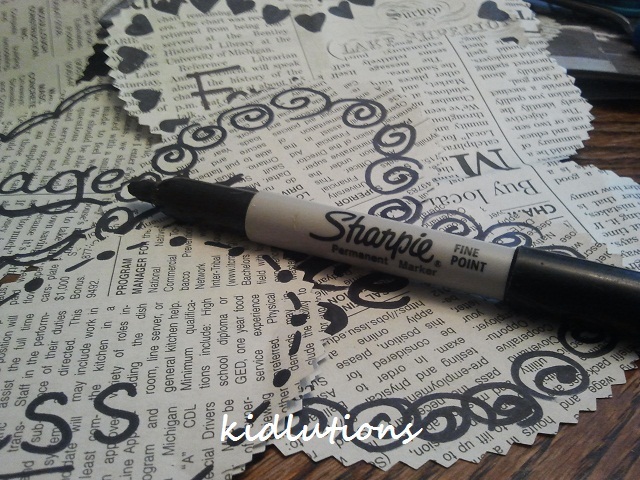 Cut out heart shapes from newspaper or old books. 2. Decorate as you wish…black and white or full out color. We used a Sharpie. 4. Use crumpled up tissue paper or newspaper to stuff your heart. 5. Stitch the sides together, leaving a space large enough to get your stuffing in. 6. Stuff, stitch the opening closed and you’re done! 7. Enjoy! Play away! Have fun! If you are a parent, educator or clinician looking for more ideas to help kids grow their kindness and compassion, find some inspiration HERE! Looking for some “love”ly decor for Valentine’s Day? Here’s some more cuteness here.